Wallowa, Oregon (population 870), located in the fertile ranch lands of the Wallowa Valley, is rich in early American heritage. Its Native American name, which has been translated both as "land of the winding waters" and "fish trap,"� reflect the area's bond with its earliest agricultural inhabitants. At the time of Lewis and Clark's arrival to the Northwest in 1805, the Nez Perce Indians occupied vast tracts of land in what is now, Oregon, Washington and Idaho. A basically peaceful community, the Nez Perce is credited with assisting the Corps of Discovery during its expedition. The Native Americans were later relocated by the United States government to outlying reservations. Towns such as Wallowa and Joseph (named after the historic Nez Perce leader) are reminders of the area's historical significance. Framed by the picturesque landscapes of the Wallowa Mountains, the town of Wallowa is best known for nearby natural attractions that include the Eagle Cap Wilderness Area and Wallowa Lake. Nordic and alpine skiing are available in the Wallowa Lake area, which is serviced by a tramway to the top of Mt. Howard. Eleven different rivers run through the nearby Wallowa Whitman National Forest, affording plenty of camping and fishing opportunities. While Wallowa is somewhat off the "beaten track" of U.S. 84, (the main thoroughfare from Boise, Idaho to North Central Oregon), a visit to the area is well worth the trip. Highway 82 east from La Grande takes the visitor through the Wallowa Valley and a series of small towns. 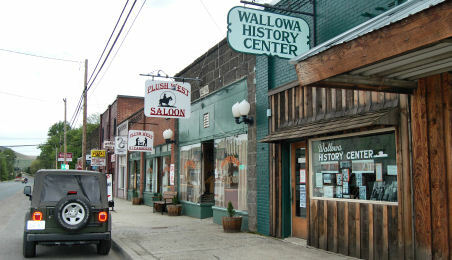 There are several restaurants and motels in Wallowa, as well as in the nearby county seat, Enterprise. Following the highway further east links the traveler with the Hells Canyon National Recreational Area, whose 7,900 foot-deep canyon is known throughout the Northwest as the "Grand Canyon of the Snake River."